Averroes is a Gutenberg compatible markdown editor that allows the user to write and edit Gutenberg blocks with Markdown. 1. Download, install and activate the Averroes plugin as usual. 2. Make sure you have Gutenberg enabled in your WordPress. 3. 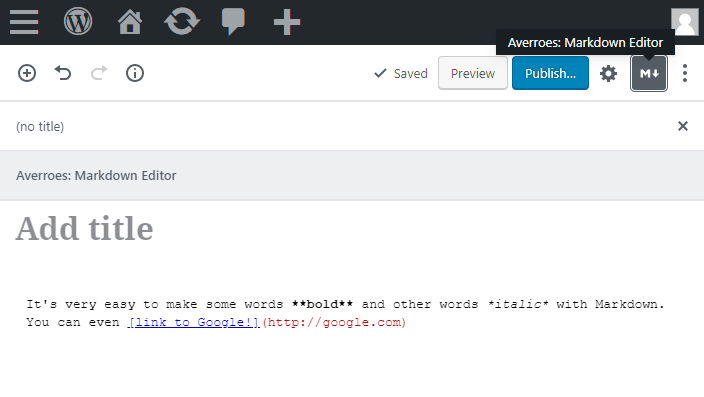 In the editing page, click the Averroes button to switch the editor to the Markdown. 4. To preview your content, just click the Averroes button again. I recently have created an all-in-onWordPress Markdown Plugin, it provides a variety of features such as Markdown editor, live-preivew, image-paste, HTML-to-Markdown helper, and more..